We sponsor Eric's and Ibrahim's education. Both of them live in Kayole Orphanage. We receive letters from them telling us of their progress. 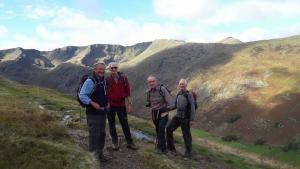 Rotarians from other clubs are welcome to join us on our walks which are on Wednesdays. They usually start around 09-30 and finish early to mid afternoon. To find out where we are going next use the contact tab on our homepage.